Description - Our Evolve carpet tiles feature a stripe/patterned design which can be combined with our Emerge carpet tiles to create a more customized flooring surface. These carpet tile squares come in 3 popular colors and can be used as a customized area rug or as flooring for a whole room. These flooring tiles feature a backing that is comprised of recycled PVC, adding weight and durability to each tile, and are also very 'Eco-Friendly'. These tiles are very easy to install, only needing the accompanying Tile Tabs to hold the tiles together, and can be installed in both residential and commercial environments. Evolve tiles are also backed by a lifetime warranty, ensuring that you will have a floor that will last for as long as you own your home. Recommended Installation Pattern - Ashlar, Brick, or ¼ Turn (Parquet). Recommended Uses - Our Evolve Carpet Tiles have been used in both commercial and residential applications because of their durability, versatility and ease of installation. Because of these facts, carpet tiles are quickly replacing broadloom carpet and have been installed in nurseries, basements, kitchens, bedrooms, weight rooms, home gyms, garages, workout rooms, and elderly care rooms and many other areas. Can be installed anywhere in your home. 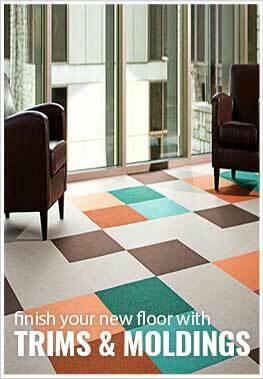 Can be combined with our Emerge carpet tiles to create a more customized floor.